There are wonderful moments in life that bring you back down to earth with a bump, that knock any delusions of grandeur out the window, that make you realise you don’t have as much influence as, perhaps, your slightly over-inflated ego suggests – and this happened to me last week. So, as a result, the person who resulted in me being taken down a peg or two must be mocked – it’s the law! So, Mr Pete Brown, stand up and take a bow as an ‘influential beer writer’! Me, I get scumbag journalist, but Pete, he gets ‘influential beer writer’! All right, the scumbag bit might have been my inference but with Mr Brown getting ‘influential beer writer’, I’ve clearly got to up my game people! With this kind of accolade bestowed on him at a SIBA event, no wonder there are people now looking at his influential beer writer words in light of theories and expostulations by French philosophers & theorists like Roland Barthes or compared to cloud-based projects on the web, or the wisdom of crowds by James Surowiecki, the influential New York Times writer. In fact, his recent rallying cry to improve blogs, to make them more than just ‘I drank this, it tasted like that’ could even be looked at through the schools of thought of Motivationists, Consequentialists and, at a push, could even be glanced at through Kantian theory if you look a bit sideways! But, however you look at it, that particular post is certainly having an influence on the blogosphere, so his accolade is correct and when I have the time to post more it will be with that bold statement in mind. Anyway, there was another reason for this ramble (apart from taking the mickey out of myself and poke a bit of good-natured fun at Pete), I had a bet with manager of the Rake Glyn Roberts that we could both write a post about this event and get influential beer writer in to it as many times as possible in around 350 words! Sorry, but after a few beers these things seem like a good idea, and at least I tried to give it some sort of relevance! Don't listen to Pete, he's just trying to pull an Alex Ferguson Jedi mind trick on you (famous words of Cooking Lager)to keep his number one spot. I find him no more or less influential than yourself (actually... Probably less). You missed the opportunity to consider how Focault has influnced beer blogging without us noticing it. There are probably French beer blogs that lift the level of discussion to more sophisticated levels. One person's scumbag is another person's sage. I think he's rather prescriptive in his opinions. What's the significance of the flying saucer on Mr Brown's head? 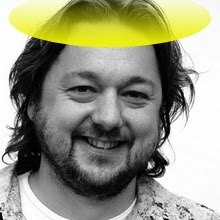 It was a very hasty photoshop effort of a halo, not the most successful as I had three minutes to my deadline of posting at the same time as Mr Rabidbarfly (to whom I say pot, kettle, black!) and the results weren't entirely successful! Hi Mike, would you mind telling me who nominated me so I can thank them please? I'll do this by the end of the week. It's a concept I started in Sweden a couple of months ago and it's been a success among the swedish beer-blogers.